Bangkok’s tropical climate has become a beacon for travellers from all across the world looking to bask in the sunshine while exploring the city’s diverse attractions, including the many glittering temples, sparkling palaces, colossal shopping malls and bustling open-air markets. The year-long heat also makes the destination a perfect place to relax in the sunshine, and where better to soak in the rays than at Mercure Bangkok Sukhumvit 11’s stunning rooftop swimming pool. As a celebrated member of the global Accor Hotels family—Mercure Bangkok’s ethos is to combine style and functionality, offering all the facilities you desire in a fun and vibrant setting. The hotel’s rooftop pool and terrace area also embodies this approach, featuring a sleek pool, colourful lounge area, friendly service and fully-equipped open-air Bangkok rooftop pool bar that serves delicious light bites and inventive cocktails. All the elements needed for a tropical sanctuary in Bangkok’s bustling city centre. Mercure hotel’s rooftop pool Bangkok situated is perfect for every guest, whether you are looking for a one-off Bangkok pool day use, or are staying in the city long-term, because of many reasons. One, is its central location at the heart of Sukhumvit which allows for easy connection to the city’s public transport links such as the BTS SkyTrain, MRT Underground as well as the various public taxis, tuk tuks and motorbike taxis parked for hire. The pool and adjacent terrace area also allow for unrivalled views of Bangkok’s unique and impressive skyline, which comes alive once the sun has set. 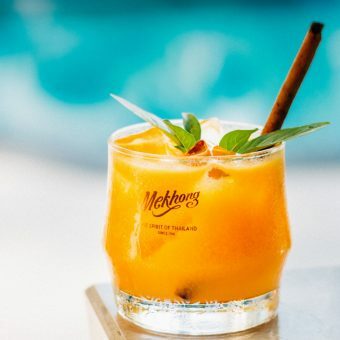 The PL-floor of Mercure Bangkok is also a fitting place for evening get-togethers as the pool bar, considered one of the best pool bars in Bangkok, is a great spot to relax with a refreshing drink in hand. Whether it’s a cocktail created by one of our expert mixologists, a beer from the selection of local taps and imported bottles, or a glass of wine from our curated cellar, there are options to suit all visitors. The bar also offers a menu of nibbles that range from Thai favourites to International and fusion staples that are perfect for enjoying at any time of the day and can be conveniently served poolside for a relaxing dining experience. There are diverse reasons Mercure Bangkok Sukhumvit 11’s pool and terrace area is popular with both locals and visitors. From the large pool and comfortable sun loungers to the stylish bar area and delicious food and drink menu, you can find everything and more at our city centre rooftop sanctuary!